A suspected kidnap kingpin, Chukwudi Dumeme Onuamadike, also known as Evans, who was arrested by police in Lagos said on Sunday that he chose to collect ransom in American dollars to be different from other kidnappers. The suspect, while being paraded at the State’s Police Command in Ikeja, told newsmen that he started the business of kidnapping in 2015, after he left his spare parts business, a claim that contradicted the police statement that he was declared wanted since 2013. Police spokesman Jimoh Moshood, a Chief Superintendent (CSP), who paraded him and his gang, said Evans ran a highly sophisticated operation where members did not know themselves. He said he started the evil trade under the late notorious Chyna, adding that he was among those who attempted to kidnap the owner of Young Shall Grow Motors, Chief Vincent Obianodo. Two members of the gang, he said, were killed in the operation in which Chyna died. He started his own gang, adding that he has six men in Lagos, who he sends to any part of the country to operate. They went in groups of three or four to execute any mission, Evans said, adding that others were recruited for particular operations and discharged once the job was done. The suspect claimed that he never killed adding that most killings were done by his gang members. “Once the victims pay the ransom, the money goes to the people who own it. I don’t have a boss but some people own the money. Does money stay with a human being? (He queried reporters in Igbo). “I have people heading different sections. There are two gangs that work for me in every operation. It is not all the time I follow them for the job. Most times, I control them on phone. The two gangs do not know themselves and neither of them knows my house. “Two people take charge of the detention camp at Igando and on every operation, I pay them N2million each. My parents are in the village. My mother knows what I do but she has never approved of it. I have five children. Three boys and two girls. I sent my family to Canada. “I have dual citizenship – Nigeria and Ghana. I got visa for my family in Ghana because I couldn’t get it in Nigeria. I have not left Nigeria since 2007 that I returned from South Africa but my family usually travelled and I also give money to people to buy whatever I need or I buy online. “Most of our victims are targeted and picked along the road or before they enter their homes. We do not pick victims from their homes”. 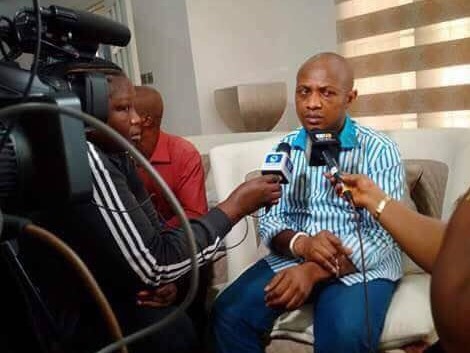 On how he was arrested, Evans said he believed it was “time for me to be arrested; that was why I was caught because I have always been in Nigeria”. “I am suffering from abdominal cancer and I am always on drug,” he said. “Uche Amadin is in charge of the detention camp at Igando. At first, I told him I was into International business (drugs) but along the line, he knew it was kidnapping and he stayed with me. He was the one who brought his wife into it not me because he was the one who said I should rent a house for them with his wife’s name. Evans, who wasn’t sure of how many people he had kidnapped, said the highest he had collected as ransom was one million dollars. “I chose to collect ransom in dollars to be different, and the maximum I have collected as ransom so far is 1 million dollars. “I work in two groups. A team moves with me to kidnap victims while we hand over to the other team that takes the victim to the hide out. “Kingsley introduced me to kidnapping, but I usually get my ammunition from one Chinedu and Ehis whom I met at Ago-Iwoye. According to the police, Evans collected $1million from no fewer than four of his victims. * James Uduji, who was kidnapped close to his house at 7th Avenue Festac late last year. The Evans gang held for six weeks. He paid $1million to regain his freedom. * Chief Raymond Okoye – Odu- Na –Ichida,, who was kidnapped in 2015. He also paid $1million as ransom. He was released after two months in captivity. * Uche Okoroafor, a trader at Alaba who was also kidnapped in 2015 for three months, also paid $1million. * Elias Ukachukwu kidnapped November 2015 similarly paid $1million. The police said the Evans gang demanded an additional $1million, claiming family members were rude to them during negotiation. The Force PPRO, Jimoh Moshood said that the suspect had collected billions of naira from his victims and had property in and outside the country.